Welcome to cheleguanaco's blog (AKA Angel Magaña), a small corner of the blogosphere dedicated to my insights on SugarCRM which I hope you will find helpful. Did you know that Sugar supports 3 different mechanisms for authenticating a user upon them attempting to access the application? These options provide a flexible authentication model for Sugar, but the options aren't mutually exclusive and their interaction can sometimes cause a bit of confusion. 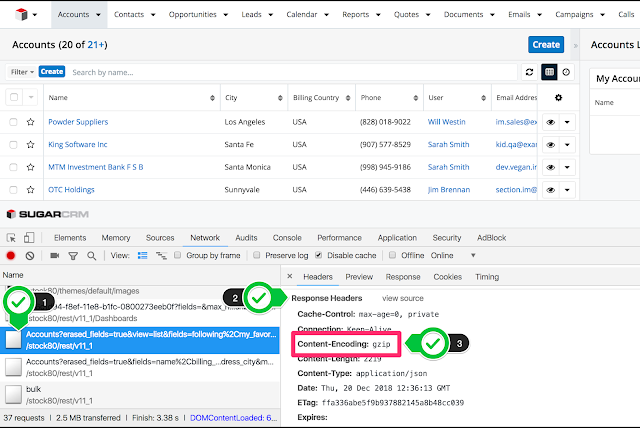 For example, it is possible to configure a Sugar instance to use SAML and at the same time allow a user to access the instance by either providing SAML or standard Sugar credentials. 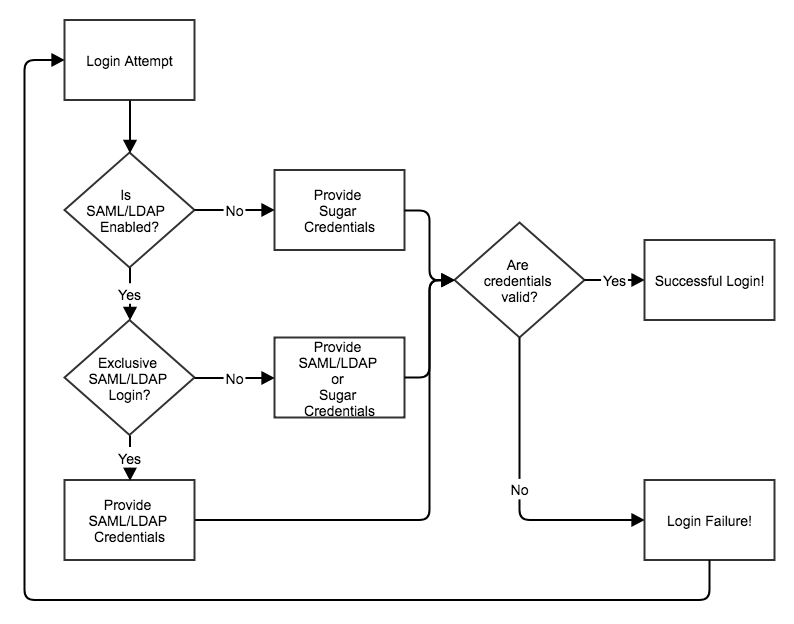 It is also possible to configure Sugar such that the LDAP/SAML option is only applicable to certain users. 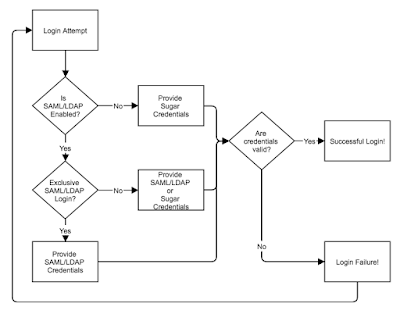 To alleviate some of that confusion, I have created the below flowchart to describe the process used by Sugar, taking into account the various authentication options that can be configured. I hope this helps answer some of your questions on authentication and Sugar. Question: Which would download faster, a 3.5 MB sized file or one approximately 500 KB in size? It is not a trick question. Without a doubt, our expectation would be that the smaller sized file would download faster, regardless of the speed of our network connection to the server. But how can we reduce the size of payload if we cannot trim the actual contents? A quick and easy way to reduce the size would be to compress the content to be sent in the response. If we apply this principle to Sugar, the compression of payloads sent from the web server to the browser would result in a snappier user experience, due to faster retrieval of data and other necessary components. As a general rule of thumb, we should always implement a compression methodology in order to help us achieve the best experience possible. But how can one determine if compression is enabled and being utilized by the web server hosting a Sugar instance? The image in Figure 1.1 helps us answer that question. To answer our question we must examine the web requests exchanged between our web browser and the web server. This can be easily accomplished within Chrome by accessing the Developer Tools and reviewing the contents of the Network tab, as illustrated in Figure 1.1. As illustrated in the code, an anonymous function is defined for the success: parameter. This is the code that will be automatically executed upon a response being received and is capable of interacting with the JSON response -- found in the data variable. Note that a similar approach can also be used to define an error anonymous. 19 year veteran of the CRM world and Co-Author of: Implementing SugarCRM 5.x (Packt Publishing - Sept 2010). Avid runner and enthusiast of most anything that gets me outdoors. Fan of just about all sports, but specially fond of soccer. Long time open source advocate, which makes my professional life as Technical Solutions Architect at SugarCRM quite exciting. Opinions and comments shared on this blog are my own and aimed at providing help to the SugarCRM community, which I always enjoy. ©2009 - 2011 Angel Magaña. Simple theme. Powered by Blogger.